Directions: From I-24 take Rt. 146 east toward Dixon Springs. Just east of the intersection with 147 is the entrance to Dixon Springs State Park on the left (if you come to the Chocolate Factory on the right, you passed up the park entrance). Go into the park and continue on the main road, staying to the right at the fork, for about .5 mile. The falls are to the right. 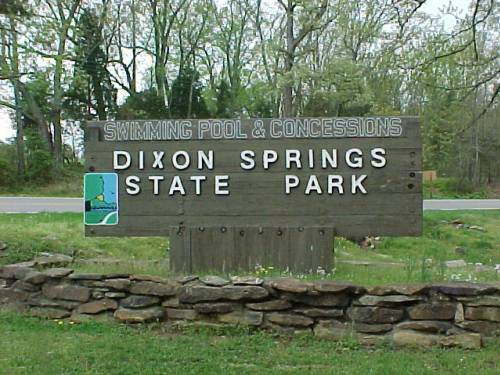 Notes: I visited Dixon Springs Falls on April 17, 2003. The first photo above is taken from the parking area off the main road. The second photo is taken from the footbridge shown in the first photo. To get to the footbridge, follow the road beyond the falls up the hill and swing around to the right. 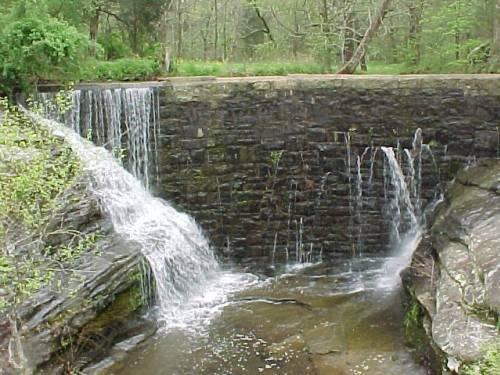 I stumbled upon this waterfall, thinking the Dixon Springs might be the source of a waterfall in the park. The water comes from a creek, but I don't know the name of it or whether or not the springs contribute to it. I also don't know the actual name of the falls. I named it Dixon Springs Falls because that is the name of the park.I'm also guessing the height of the falls - and I may be way off. 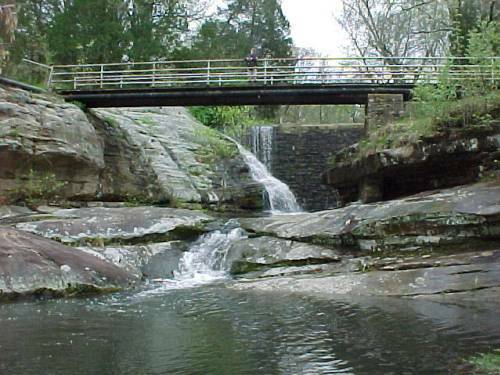 The upper falls actually flows over the stone wall on the left side, and then flows down the rocks on the left. The water is coming through breaks in the wall on the right side. The creek then flows over the lower falls into a little pool. Someone was fishing in the pool when I was there. Page last updated 19 Apr 2003.